Welcome to the Monograms Ltd. website! 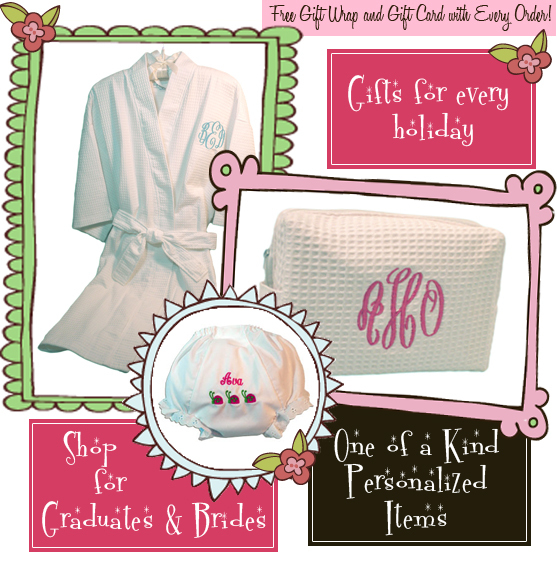 We offer a wonderful selection of personalized monogrammed gifts for everyone on your list. We'd be happy to assist you with gifts for bridal parties including embroidered cosmetic bags, spa items, and keepsakes for bridesmaids, and personalized gifts for the groomsmen. We also have great customized gifts for high school and college graduates, for teachers, and hostesses. Don't see it on our website? Please contact us - we have many more items than we can fit on our site! If you have any special requests, be sure to contact us. We'd love to create a one-of-a-kind gift for you. We are all about delivering one of a kind exquisite gifts to meet all your needs.